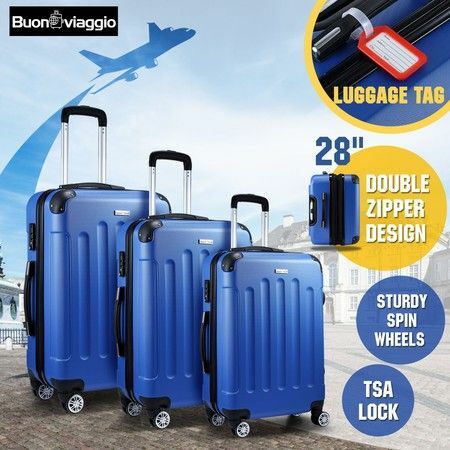 Pack all your belongings and other necessities tightly in the 3 Piece Luggage Sets Hard Shell Travel Spinner Suitcase Lightweight Trolley w/ TAG & TSA Lock - Blue. The 3 piece luggage sets include one 20 inch suitcase, one 24 inch suitcase and one 28 inch suitcase, which allows you to assign all your clothes in perfect order for your own preferences. Featuring new ABS hardshell material with polyester lining and aluminium handles, the carry on luggage can do a better job of resistance to pressure and can be last for years with careful maintenance. The 360-degree spinner wheels and pull rod even ensure you maneuver the luggage effortlessly anytime anywhere. The TSA approved lock can perfectly protect your belongings from intentional theft. The travel luggage also comes with 3 luggage tags to identify your own luggage at the first sight through the numerous suitcases. Take the lightweight suitcases or present them as a gift to yourself or your lovely ones to start a relaxed but stylish journey from this moment. This is a great purchase especially for the price I recently took the luggage on a long overseas trip and it was great and my luggage arrived in the same condition. Im very pleased with the purchase. Plus the wheels move smoothly so you dont have to push with effort in the airport. Excellent seller nice product. Received in time.Excellent seller nice product. Received in time.Excellent seller nice product. Received in time.